Interview: "Bum bags are currently very hot!" The backpack has experienced a massive boom over the past few years. What are you doing to keep it relevant? The backpack is the core Eastpak product since 1976 – it is important that the item stays true to Eastpak’s DNA while addressing trends as well as new consumer needs. The iconic Padded Pak’r will come for spring/summer '18 in 107 variations – some of which are plain seasonal colors, others special material makes and more functional versions which include laptop sleeves and organizers. Totes, gym bags, fanny packs, pusher bags…which bag shape do you think will be the next cool? While the backpacks are on trend, bum bags are currently very hot! I believe weekenders / duffel bags are next on the list. They are functional as well as versatile – you can use them for gym, a weekend away or even to go to work in a casual style. Which materials and colors do you see coming for the spring/summer ’18 season? Following the athleisure trend – mesh as an allover is a must-have for the summer! Which are your top three best-sold products of the current season? Padded Pak’r Backpack, the Springer Bumbag and our range of Tranverz wheeled upright. You have recently launched the first series of your premium LAB collection. Who are you aiming at with this new collection, is it distributed differently? This collection addresses a small number of high-end retailers (less than 100 worldwide). We aim at the consumer who wants something different with the highest level of design and specs. Also, someone looking for an exclusive item as each LAB edition does not go over the 500 pcs produced globally. Do you think that bags design is a rather limited in comparison to fashion design? In a way, yes – because a bag has a key purpose – to carry your stuff. Firstly, it needs to meet functional requirements (especially for Eastpak) and then the creativity comes in to play. However, there are many things that still have never been done before on a bag. What are the main characteristics that a successful bag/piece of luggage HAS to fulfill? For Eastpak the bags must be straightforward allowing you to carry your belongings in an easy way. The bags should also be reliable, with our 30 years warranty the customer can rely on the seams, zippers, wheeling system, etc. Finally it needs to fit with the end consumer’s personality, regardless of whether they are looking for the simple black look or that crazy print trolley. Eastpak annually works together with very high profile designers and personalities in the Artist Studio context. 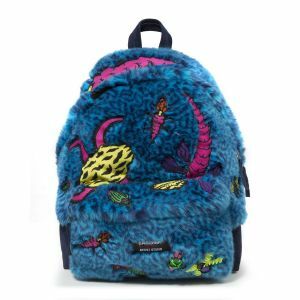 Is it hard for them to transfer their creativity on a simple backpack? Was there ever a piece of work that you found especially outstanding? Our Padded Pak’r operates as a blank canvas – most of the designers we are working with are asking to “play” with this icon. Vetements created a 2-in-1 product by simply turning the front pocket into a bumbag. Another one to remember was the Jean Paul Gaultier Artist Studio creation that was both a jacket and a bag! Are there any new collaborations or special product launches coming up that you are very excited about? We are proud to launch December 1st our first collaboration with the Andy Warhol Foundation: Our strength of bringing colorful print on iconic shapes (backpacks, bum bags and luggage) will be enhanced by original Andy Warhol portraits. Japanese craftsmanship will be celebrated thanks to an exclusive production of 10 unique backpacks made from 1950’s authentic Shibori cloth. Finally stay tuned on July 11th to view the catwalk featuring the latest Raf Simons by Eastpak collaboration from which a special capsule built on our Padded Pak’r will be commercialized.